For travellers who are looking for an island getaway for the weekend in Peninsular of Malaysia, Pangkor Island is one of the best choices for a holiday retreat. Located in Manjung District of the Perak state in Malaysia, it is a popular spot among the locals and tourists as it is an affordable travel destination with affordable hotels facing the beautiful beaches. Whether it is an escape from the bustling city life or going on a school trip, Konsortium Mesra Duta is ready to ship you to and fro Pangkor Island when you make the online booking for the ferry ticket through Easybook. It is relatively easy to get to Pangkor Island upon reaching Lumut town in the Manjung District. From there, take a ferry from the Lumut Jetty and travel straight to Pangkor Island. 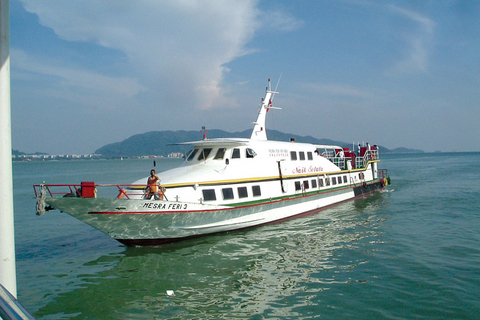 Konsortium Mesra Duta Sdn Bhd is one of the well-known ferry service providers based in Perak and it offers ferry route from Lumut Jetty to Pangkor Island with return routes daily. Check out the Konsortium Mesra schedule available at Easybook for up-to-date ferry timetable and ferry ticket prices. Konsortium Mesra Duta ferry takes approximately 30 to 45 minutes to travel from Lumut Jetty to Pangkor Island but it depends on the weather condition of the day. Please take note that the ferry usually will also stop at SPK Jetty at Sungai Pinang Kecil, so make sure you alight at the Pangkor Jetty instead to get to main attraction of Pangkor Island. It is hard to resist not going into the beautiful ocean when you arrive at Pangkor Island. Besides swimming, there are many other water sport activities happening on the island such as jet skiing, kayaking and hopping on a banana boat. Seafood lovers, Pangkor Island is definitely up your alley as it is famous for affordable fresh seafood. There are many restaurants that you can dig into some of the most delicious seafood such cooked in different styles from crabs to squids. Anchovies or more known as ikan bilis in Malay language is one of the most famous products in Pangkor Island. There are a lot of manufactures located on the island where you can find dried fish product on the island, as well as purchasing fresh dried fish product and anchovies at the many shops nearby. If you want to live like the locals, then the most convenient way to access the island is by motorcycle or bicycle, so make sure to rent them at affordable prices from the various shops. It is a very convenient especially since you don’t need a lot of parking space. Konsortium Mesra Duta ferry tickets are now available for online booking at Easybook now. Check out the Konsortium Mesra Duta ferry schedule at Easybook and choose the travel time that fits your plan and proceed to make the ferry ticket online booking. After making the payment, the order summary will be sent to your email within the next 24 hours. Make sure you print and bring along the order summary in order to collect the ferry ticket for round trip only at the counter which is located at Lumut Jetty, Perak. Check out this How to Book guide we have prepared for you.